What is a tech innovation hub anyway? 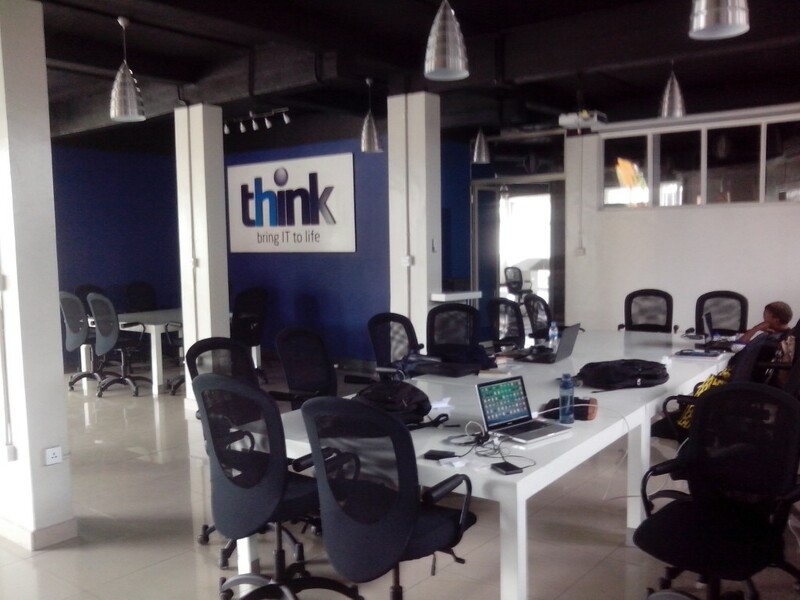 Soon-to-launch THINK in Kigali: Incubator? Hub? Both? 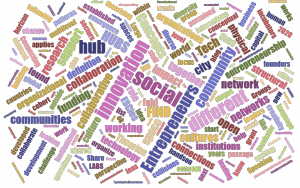 Also refer to related posts in the Stanford Social Innovation Review and innovationmanagement.se where colleagues and I expanded on some elements outlined in this post. Innovation and entrepreneurship “hubs” and “labs” are all the rage these days. A wide range of actors is convinced that hubs represent a genuinely new and exciting model for supporting (tech) entrepreneurs, in particular in Sub-Saharan Africa, which is the focus of my research. While this list illustrates that innovation hubs are popular, little analysis has been done on why that is. One obstacle is that many, if not most, of the discussions around hubs use the term quite loosely. For one, “hub” has several connotations that our zeitgeist sees as desirable (such as open and egalitarian interaction, collaboration, or grassroots), and it appears to me that the word is often used as a brand more than a meaningful descriptor. So, what is a (tech innovation) hub anyway? Is it just a trend term replacing “incubators”, “R&D labs”, “science parks”, “technopoles”, or “training facilities” that have recently fallen from grace? Is there anything special and new about organizations like iHub or the Impact Hub? A few weeks ago, I joined a group of researchers gathered by Tuukka Toivonen to discuss these questions. All of us had done empirical research on hubs, so we had an intuitive understanding of the concept. The group had also examined hubs with different goals, located in geographical and cultural contexts spanning Africa, Europe, and East Asia, which gave us a good range for comparisons. We were clear that hubs shouldn’t be reduced just to the hub space, and that they are instead a particular type of organization. Yet, we soon got lost in a jungle of buzz words and vague paradigms, and we found it surprisingly difficult to pin down the uniqueness of hubs as a new organizational form (if it is one) with conceptual precision. We also noticed that the ideals that hubs aspire to are often quite different from the more mundane realities of life and work inside of hubs. So we decided to derive a hub definition based on the stereotypical ideal of a hub, which could then serve to distinguish hubs from other organizations based on their vision and mission. Only at a later stage, we wanted to compare ambition, reality, and actual “impact”. Hubs heavily emphasize that they are merely a meeting and convening point for a community, and that without this community, they would be nothing. A hub community is not just any group of people. Members of the community share a certain identity and have a sense of belonging and/or participation. This often translates into a higher mental activation (inspiration, motivation) around whatever is the common cause of the hub. 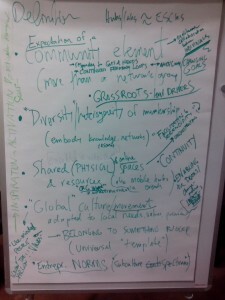 The community idea is also at the heart of another defining feature of hubs: their self-organizing and adaptive nature. Hubs cannot be set up in a top-down manner; they always emerge from the “grassroots” initiative of innovators and entrepreneurs. While hubs are more stable and continuous than event series like Barcamps, Startup Weekends, conferences, or innovation competitions, they also constantly adapt to changing community needs. Accordingly, hub managers usually see themselves less as leaders and more as facilitators. While donors and sponsors are usually needed to fund hubs, they are only seen as supporters that are not allowed to impose an agenda that would not be in line with the needs that the community articulates. This is in direct accordance with principles of the Startup Community movement. However, constant adaptation often does not jive well with institutional frameworks of funders that are based on pre-specified accountability, long-term planning, and targets, in particular in the context of monitoring and evaluation mandated by development organizations. Implicit in the previous points is another hub attribute that is noteworthy because it is often forgotten in discussions on the “impact” and effects of hubs: hubs are not themselves creators or implementers of innovations (or projects, startups, apps, etc.). Instead, hubs see themselves as enablers of innovators and entrepreneurs, or, even more broadly, doers of some sort. Hubs can be more or less selective and stringent in terms of which doers they support, but in the end entrepreneurs are seen to be the ones with the real-world impact, while the hub just enables them. As one can imagine, this makes attributing and quantifying the impact that the hub itself has very challenging, especially if the hub offers a range of membership tiers and a variety of more or less hands-on programs. This also means that expectations towards a hub’s impact can hardly be codified as pre-specified targets (such as “number of startups launched”), and instead evaluations need to trace indirect and unexpected causal pathways of impact that result from the enabling-the-doers setup. Maybe the most interesting feature of hubs is that they aim to convene like-minded individuals while at the same time bringing together people with different backgrounds and knowledge. For instance, to stimulate software and mobile app innovations, hubs usually aim to gather techies and coders, but also bring in business people and investors. At the core is the idea that startups need complementary inputs (e.g., creative product design and financing), but also that innovation inherently relies on new and unlikely combinations of existing knowledge. Hubs build on the notion that ideation and creativity can neither be pre-specified nor coerced, and so they aim to create a structure in which individuals serendipitously interact with others that they would not typically meet. This is similar to the argument that “thinking in silos” inhibits creativity, and so hubs invite people to step out of their regular work routines and openly interact with new contacts until a “happy accident” happens. Such a setup also relies on a non-hierarchical and open relationship structure between community members: everyone is encouraged to engage with everyone else. 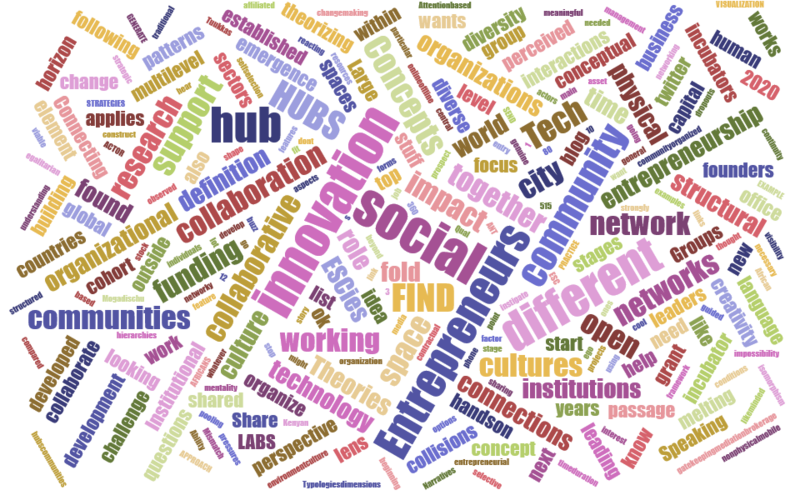 What exactly are the right combinations of like-mindedness and heterogeneity is a difficult question, and to us it seemed as one of the most interesting lines of inquiry for research on hubs. Another intriguing facet of hubs is that they emphasize adaptation to local context, but at the same time tend to frame themselves as part of a global movement. The “global entrepreneurship movement / revolution” often serves as th e overarching value and belief system, and the Lean Startup and Business Model Canvas are examples of more concrete shared understandings of tech entrepreneurs. In fact, co-working itself is increasingly seen as a global movement, and it has started to yield insights and templates for the design of a hub space (which might explain why hub spaces look so alike across vastly different geographies and cultures). Importantly, hubs become local representations of globally homogenous understandings (“movement”), but in the local context, where these understandings are unique and new, the hub can actually host a subculture (“revolution”) compared to incumbent and prevalent organizational designs and ways of doing things. Now, I want to be clear that an organization does not necessarily have to meet all of these attributes to qualify as a hub. Instead, this list is meant to describe the idealized and stereotypical hub concept. Hubs usually only emphasize a few of these attributes, or they might aspire to live up to each one but in reality cannot meet all of them. Also financial sustainability plays a major role: hubs often have to make compromises and budge to funders’ and sponsors’ agendas to keep their ship afloat. Yet, I do think that the above description helps us to distinguish hubs, for instance, from organizational models that only provide immediate business and resource support without a communal element, like traditional incubators. We also now have a better basis to discuss what is new about hubs, and how we could tackle questions about their effectiveness and role in innovation (eco)systems. My hope is that we can build on this start of a conceptual understanding to improve the quality of our discussions, and stop comparing apples to oranges. Still, an actual hub will almost never fall neatly into the outlined concept. In fact, incubators, accelerators, and even science parks have started to borrow elements from the hub concept, resulting in mashups of organizational models. Another trend is the co-location of pure hub models with more structured support programs, like inside and near Bishop Magua Centre in Nairobi. In upcoming blog posts, I will outline ideas for theoretical perspectives and empirical research, as well as basic hub categories and preliminary findings on tradeoffs and funding structures from my previous and ongoing research. Please get in touch with any feedback and comments. Tuukka Toivonen provided comments and feedback to this post. My research is funded by the Clarendon Fund and the Skoll Centre for Social Entrepreneurship at the University of Oxford. In an interview that came out shortly after our workshop, Erik Hersman, co-founder of the iHub in Nairobi, reflected on the iHub and its unique features. Interestingly, his points are very similar to the attributes that we derived based on a much wider sample of hubs. This actually mirrors a broader problem and debate about incentive-setting and results measurement in international development projects, for instance, discussed by Robert Chambers here. In fact, people have started to call the building itself an “ecosystem”, for example, the iHub community manager.